I’ve been lucky enough to have been to a number of musicals now and I’ve loved every single one in it’s own different way. 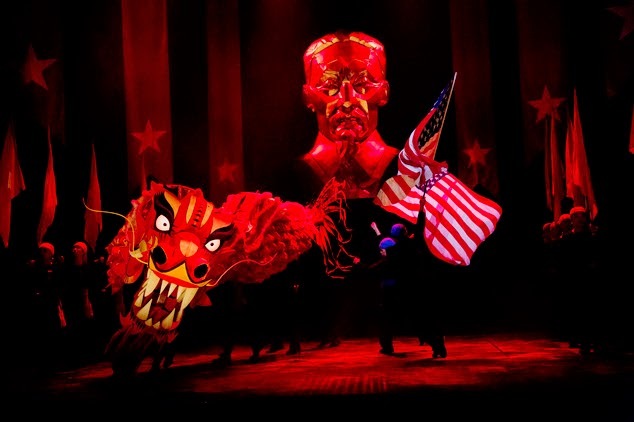 However this weekend, to mark a very special occasion, I watched a musical that blew me away – Miss Saigon. Back to the phenomenon that is Miss Saigon. In all honesty I hadn’t heard of it until a few weeks ago. In hindsight, I know I’ve seen posters scattered along the underground but I just mindlessly skimmed over them. I later learned that this critically acclaimed show had been running for over 25 years and closed after 4,264 performances. Thank you Wikipedia! It was then revived after a 15 year break and here I was all seated and excited in anticipation. The idea of going to watch a musical about war seemed questionable but thankfully it was more a story of real love than political propoganda. The story follows a young Vietnamese girl orphaned by war, who embarks on a whirlwind romance with an American GI called Chris however tragedy prevails as the Vietnamese War comes between them. So what’s so great about it? Well, where do I begin?! The choreography is on point, the orchestra fantastic, the lighting and set are probably the best works of art I’ve ever seen. I won’t spoil it for you but at the climatic Act I finale I was left speechless by the combination of all of the above. I have to say that the opening scenes are a little bit…well, saucy, so if you’re attending with children you mgiht want to reconsider. That being said, the acting was so good that even I was convinced that I had been transported to a seedy brothel in Saigon. Whilst the plot is predictable, the ending genuinely left me wanting so much more. Miss Saigon truly is magical, that leaves no question in my mind as to why it has been running for so long. If you have had the chance to see the show, I’d love to hear your thoughts and if you haven’t seen it yet, I would definitely recommend a visit!